I’m the self-proclaimed queen of styling old hair. I usually try to shampoo my hair once a week, but sometimes I just can’t be bothered. You know how it gets — one thing leads to another and your routine “wash day” has come and gone. Over the two years and some change that I’ve been natural, I’ve figured out what styles and methods work best to maintain my hair during the extended periods of time that I’m just not in the mood for a hair styling marathon. No shame! The goal is to shampoo, detangle, and deep condition my hair every Saturday or Sunday. My scalp doesn’t get oily very fast, but cleansing and detangling weekly helps me control tangles. 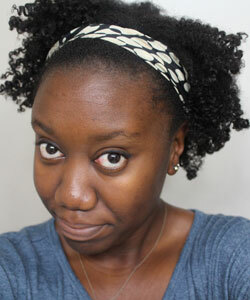 My go-to style is a twist out on clean, wet hair. 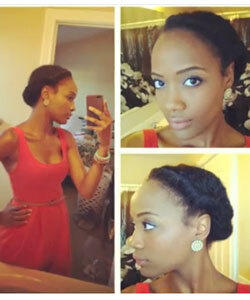 I choose this style because it’s a good starting point for many other styles. It stretches my hair out enough to add some length and prevent tangles that my shrunken hair is prone to. That wet twist out can last 2-3 days without retwisting. My hair is relatively fine and thin, so instead of getting big and fluffy over time, it shrinks at the roots and gets piecey at the ends. Not cute! You need to get to know your hair so you can restyle it accordingly. Because I know my hair is fine, I know that I can’t layer and reapply products as the weeks (yikes!) pass. Even on freshly washed hair, layering products (leave in + styler + sealant, for example) only weighs my hair down. I usually style using a leave in conditioner and a light oil or butter. When I restyle my hair, I don’t use any products. Using a spray bottle or just by running my hands under the faucet, I dampen a section of hair with water and twist. Yes, you read that correctly – water is my styling product. This prevents product build up that will force me to wash my hair sooner than later. 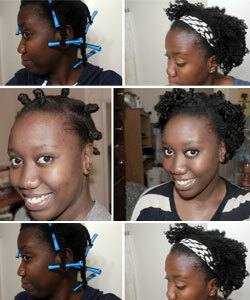 After two or three twist outs, I naturally transition into roll, tuck, and pin hairstyles. 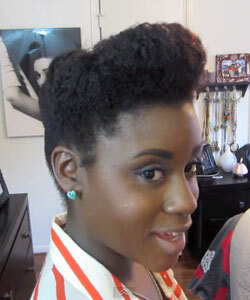 With a box of bobby pins, hair pins and headbands in hand, I attempt anything from the Grecian goddess “crown” hairstyle to the (albeit smaller) Janelle Monae-esque pompadour. Sometimes I just throw on a headscarf or bandana for a Rosie the Riveter look. After I’ve had my fill of that, I retwist my hair (only using water!) and roll my ends with perm rods. I have now ventured into the land of the Twist N’ Curl. The curled ends give a fresh look to my average twist outs, and the new hit of moisture from the water makes my hair soft and shiny! If I’ve been good about sleeping with a satin scarf and my hair isn’t too tangled, I can re-twist n’ curl or bantu knot my hair (it gives the same look) one more time. Braid outs have always been hit or miss for me. If I make the braids too large, my hair will practically be straight. If I make them too small, my thin and fine strands look so piecey that no amount of “fluffing” will remedy the situation. If my braid out succeeds, I can finally rock the big, stretched out hair that my thick haired sistas enjoy on the regular. If my braid out fails, well, at least my hair is stretched out to the max, and I can divide into sections and detangle fairly easily.